The U.S. Energy Information Administration released a study on American nuclear supply on Tuesday. Finding that -- for the first time -- Kazakstan's uranium miners have become the number one supplier to U.S. nuclear reactors. 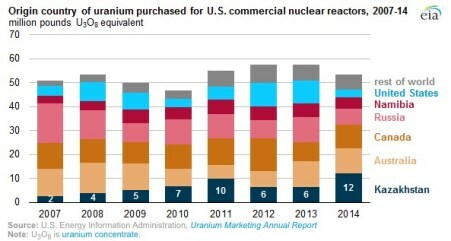 As the chart below shows, purchases of Kazakh uranium by U.S. operators jumped by 50 percent during 2014. To a total of 12 million pounds -- the highest level ever. That supply growth was enough to put Kazakhstan on top in terms of uranium supply to American users. Beating other go-to uranium producers like Australia (10.5 million pounds) and Canada (9.8 million pounds). Overall, Kazakhstan supplied 23 percent of total U.S. uranium demand for the year. 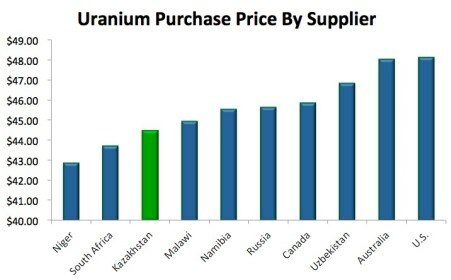 Looking at purchase prices, it's easy to see why Kazakh supply has become a favorite: Sale prices for uranium from Kazakhstan averaged $44.47 per pound in 2014 -- well below other major suppliers, as the chart below shows. At these prices, Kazakh uranium is out-competing Australian supply by over $3.50 per pound. Or almost 7.5 percent. A meaningful difference for a utility that's purchasing large volumes of yellowcake. That likely means supply from higher-cost locations like Australia into the U.S. will continue to shrink. Being replaced by lower-cost production from places like Kazakhstan and Canada (which saw its uranium exports to the U.S. jump by over 25 percent in 2014).